The 12-month S.C. Johnson Graduate School of Management at Cornell University’s Tech MBA program starts on the main campus in Ithaca, New York, and then takes place at the school’s new New York City campus on Roosevelt Island, which lasts for nine months. The program begins in May and concludes May of the following year. The curriculum for the Cornell Tech MBA is divided into two specific elements: modules and studios. The former is concentrated during the fall semester of the program, which features four modules. The morning curriculum mostly starts with modular courses, with students joining the studio for Company Challenges, Startup Ideas or Conversations in the Studio in the afternoon. Students are offered optional credits, known as Agility Credits, as well, with subjects such as human computer interaction, startup systems, scrum and agile development, storytelling for startups, and corporate governance. 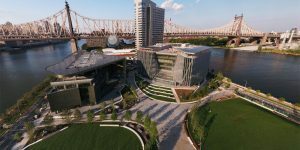 Sixty-two students are enrolled in the Cornell Tech MBA. The students are, on average, 29-years old and are 41 percent female. These students enrolled with a GMAT average of 694 and 5.5 years of work experience. Johnson’s Career Management Center (CMC) offers a wide range of career counseling services, including one-on-one career advising with one of eight professional counselors, networking events and an online job posting system. The CMC also organizes career workgroups, through which second-year students teach groups of first-year students about working in particular functions. In addition, the CMC organizes a full schedule of on-campus recruiting events, with mid-October through November and late January through March dedicated to second-year recruiting and about two months for internship recruiting starting in late January. Johnson students have many opportunities to meet company representatives throughout the year through corporate presentations and club-sponsored guest speakers. Current tuition for the Cornell Tech MBA program is $102,652. To help students finance their studies, Johnson offers a range of merit-based scholarships. Admitted students are automatically considered for certain merit-based awards, and about 30 percent of Johnson students receive related financial support. The most prestigious of scholarships offered to incoming students is the Park Leadership Fellowship, which provides a full-tuition grant to up to 25 entrants. Johnson is part of the Consortium for Graduate Study in Management, an organization devoted to promoting diversity in business schools. MBA candidates may apply through this program to Johnson, and they are then eligible for full-tuition fellowships. For those applicants who did not receive awards during their first year, there is one scholarship opportunity open to returning students, the Fried Fellowship. There is also a variety of loan options available to Johnson students, including federal loan programs for U.S. citizens and private loans for international students. Johnson has partnered with Quorum Federal Credit Union to offer international students loans that do not require a cosigner. Applicants to the Cornell Tech MBA program must submit a résumé indicating all post-bachelor degree era employment, two recommendations, GMAT or GRE scores, official transcripts, and $200 for the application. International applicants must submit the previously indicated information as well as TOEFL or IELTS scores, if necessary. Applicants may be invited for an interview, preferably on the Ithaca campus. School vs. School: Yale SOM or SC Johnson Cornell?